Ah, the popover. Light and airy, the popover is a nice complimentary side dish for our hearty breakfast entries, such as Dave’s frittata. 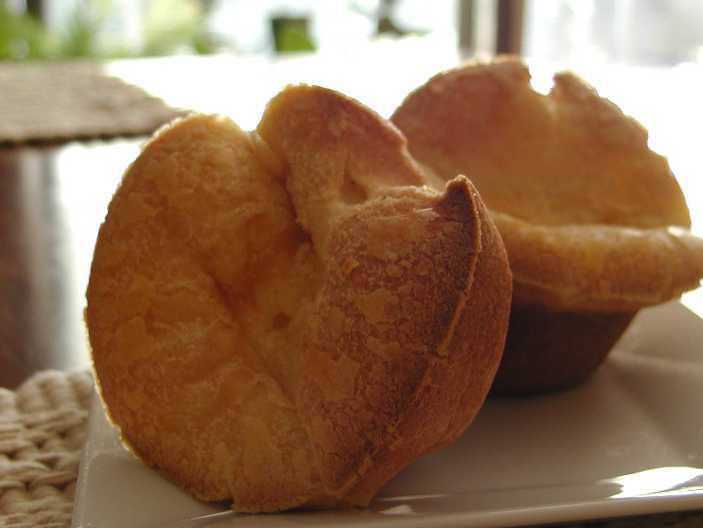 Considered the distant American cousin of the English Yorkshire pudding, the popover has been in existence since at least 1850, and the first popover recipe to be printed in a cookbook appeared in 1876. We have no idea how much the original recipe is like ours, but here’s what our version looks like. Enjoy! Whisk in butter, then milk until each is blended. Whisk in flour and salt. Spray cups of muffin pan and fill about 2/3 full with batter. Innkeeper Tip #1: To keep your popovers from deflating, use a toothpick to poke a small hole in the top to let air in. The air will fill the popover and help it to keep its puffed up shape. Innkeeper Tip #2: Use a new/good muffin pan. Popovers tend to “stick” to a pan more than muffins or breads do. Innkeeper Tip #3: The batter can be made and stored in a sealed container (we use mason jars) in the refrigerator overnight. If you make the batter the night before, be sure to shake the batter before pouring into the muffin pan cups. extra special piping hot treat!